This recipe has a sweet and tangy taste of this dish that you will surely enjoy. Sweet and spicy spareribs is an Asian dish and served on some Chinese restaurants. Now you don’t have to go to the restaurant to eat this dish, you can cook it in you own kitchen with no special ingredients or special cooking skills needed. To cook this dish; Marinate spareribs in pineapple juice, soy sauce, garlic, brown sugar, black pepper and ginger for about 1 hour. Simmer ribs with marinade for about 40 minutes or until almost tender. Drain but reserve half cup broth. Coat meat with flour. Deep fry until just brown. In a separate pan, combine broth, sweet chili sauce and sesame oil. Allow to simmer, then add meat. Stir until meat is evenly coated with sauce. Caramelize over medium heat for another 10 minutes. To see the rest of the recipe with the exact measurement of ingredients, continue reading. This recipe has a sweet and tangy taste of this dish that you will surely enjoy. Sweet and spicy spareribs is an Asian dish and served on some Chinese restaurants. Marinate spareribs in pineapple juice, soy sauce, garlic, brown sugar, black pepper and ginger for about 1 hour. Simmer ribs with marinade for about 40 minutes or until almost tender. Drain but reserve half cup broth. Coat meat with flour. Deep fry until just brown. In a separate pan, combine broth, sweet chili sauce and sesame oil. Allow to simmer, then add meat. Stir until meat is evenly coated with sauce. Caramelize over medium heat for another 10 minutes. Serve hot. Can be serve as rice topping. Hi, nice recipe you have here. 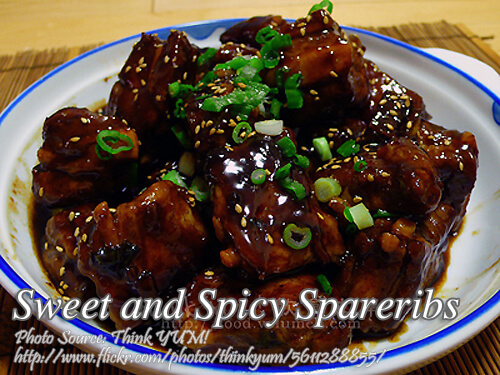 I was looking for a simple sweet and spicy spareribs recipe and I found yours! Thanks! Hi Bianca, you are welcome! Hi, thank you for sharing this! But what sweet chili sauce can you recommend to use? Pwede po ba yung UFC and the likes which can be bought at grocery stores? Thanks! Hi AC, yes that is the kind of sweet chili sauce you will use in this recipe. You can use any brand.